Delving deeper into the magical world of virtual reality, it has been reported that Fox is now developing a multiplayer game based on the Alien franchise. Unfortunately, we have no pictures or anything but there is an exclusive report on The Hollywood Reporter about the project. Unlike, the previous Alien Covenant Utero experience which is available for Oculus Rift, Gear VR and Playstation VR, this new game will be Fox&#8217;s own proprietary system available at FoxNext locations &#8211; presumably theme parks. I crept through the shadows in an underground cave, with my gun ready and my back against the wall. I looked every which way for aliens. Flying creatures approached — I shot at them. Aliens were then visible from a distance, I shot again and also used a grenade for more impact. … Sometime later, I found myself face to face with the threatening Xenomorph — and I was out of ammo! 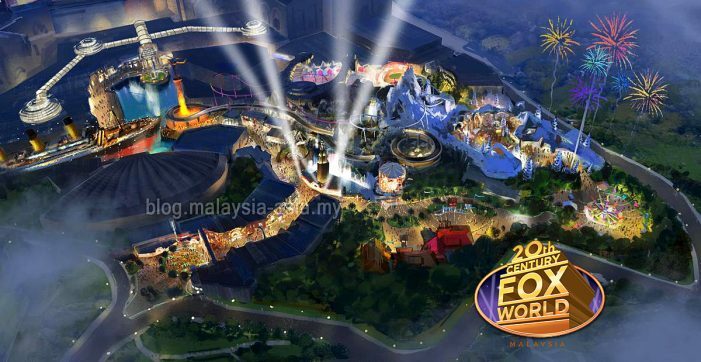 The article implies the virtual reality game will appear at Fox World Malaysia which is currently slated to open in 18 months. We all remember the concept art below from years ago showing the Derelict Spacecraft and it was no secret there would be some sort of Alien attraction. I don&#8217;t think we&#8217;ll have to fly all the way to Malaysia to play the new game though. Alien VR Game to Appear at Fox World Malaysia Theme Park? The Alien VR game is being developed by FoxNext, in association with iP2 Entertainment and its sister company, VR content creator Pure Imagination Studios. It&#8217;s supposed to be available to the public by the end of the year but we&#8217;re not exactly sure where yet. I guess we&#8217;ll hear more about it in the coming months. Keep a close eye on Alien vs. Predator Galaxy for the latest Alien and Predator news! You can follow us on Facebook, Twitter and Instagram to get the latest on your social media walls. You can also join in with fellow Alien and Predator fans on our forums! Hopefully we get something like this for home users at some point. I'm still convinced that Alien Isolation VR will be announced at some point this year. Hopefully it does well. If so, we could see a truly groundbreaking Alien virtual-reality theatrical experience in the near-future. I was hoping to see a new home Alien game announced soon. Something built from the ground-up for home based VRs sounds like something that'd be a huge hit. Personally, I'm just hoping for something with modding support so the community can support itself the way it used to with AvP2. This sounds interesting though. I'm liking these new attractions that are on the way. Aliens: Escape and now this. Meh, the tech just isn't there for it yet. I feel virtual reality is just another fad like 3D. Having played Resident Evil 7 entirely in VR, it's not just a fad. It's incredibly immersive, and the tech is only going to improve from here. Hopefully blasting Aliens with a pulse rifle with fellow fans in a virtual space from the comfort of your home will come in the near future, because that would be so cool. I wonder what's going on with this. It sounds like an awesome experience but don't think there's been any news for months, not even planned locations. I assume that's the kind of thing we can be expecting for the Alien VR game. I'll be keeping an eye on this. I am from Malaysia so it would be cool to have an excuse to go home and visit the rellies. I tried a VR Haptic fx shooter for my birthday, it's really good. But the company I went to are based out of Melbourne, Australia but shipping the technology overseas. It's still a bit buggy, but it's a lot of fun. It's really expensive per play though. No sign of the Derelict yet. I'll be surprised if this thing ever gets finished. Yeah, I am thinking the same. Plus building in Malaysia is usually very slow and awful quality. Going by their shopping centres that begin to collapse after just a few years. I hope they have qualified engineers on this project. Fox have now announced the game now: Alien: Descent. Comes out Alien Day in The Outlets at Orange in Orange County, California. Why so far away.....come to Nottingham!! Its a shame that this is not for PSVR.Would be nice with the new blaster. I want to know what FoxNet's Alien game with Cold Iron Studios is. Don't care about a VR game.